The colorful display of exuberance kicked off MassResistance's Teens4Truth conference, which took place on Friday and Saturday in Fort Worth, Texas. 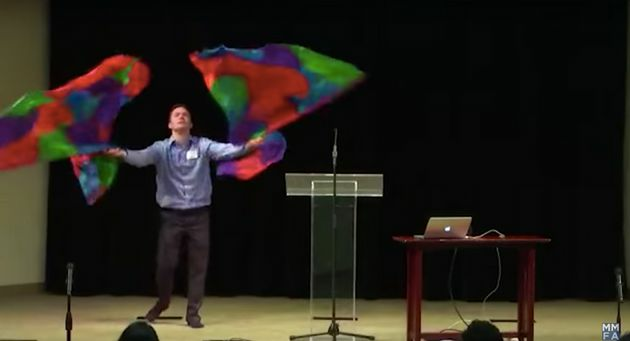 It seems impossible to take your eyes away from this video, as a man passionately tells a story of redemption and rage with two twirling tie-dye flags. It very well may be the gayest display of performance art that we've ever seen emerge from a gathering of anti-gay bigots. MassResistance is classified as a hate group by the Southern Poverty Law Center, and boasts itself as "the leading pro-family grassroots activist group in Massachusetts" ― though the organization has recently expanded to other states. The group is notorious for extremist views on LGBTQ rights and is responsible for the infamous "Health Hazards of Homosexuality" pamphlet circulated at the 2017 Values Voter Summit, where the president spoke earlier this year. We're not sure what's going on in this video, but someone book this queen for Pride 2018!